A Midwestern state that borders Lake Erie and the Ohio River has been a favorite place for pioneer settlers for years. The Native Indians of Ohio are the Miamis, Wyandots, Delawares, Shawnees, Ottawas, Mingos and Eries. Many of those tribes had originated in other areas like New York and New Jersey, but were forced to the Ohio area as the European settlements took over their native homelands. In the 1700s the French had the fur trade routes, including across Ohio. After 1754 when France lost in the French and Indian War, Great Britain received the Ohio lands. The new United States then got the Ohio region after the American Revolutionary War. Ohio was now part of the Northwest Territory and slavery was not permitted in the new territory. There was the founding of Marietta by a group of American Revolutionary War veterans. Ohio’s population numbered only 45,000 in December 1801, but the U. S. Congress determined that the population was growing rapidly and Ohio could begin the path to statehood. The assumption was that it would exceed 60,000 residents by the time it was admitted as a state. In 1803 became a new state in the Union. Migration from other states made a steady push into Ohio in the early 1800s. Looking at Ohio genealogy, an important segment to include were the large group of Amish from Pennsylvania. Most settled in Holmes County, now the largest community in the country. As Ohio grew many of the Indian tribes moved further west, but many remained in the region. During the American Civil war, Ohio was a Union supporter and had thousands of soldiers, including three of the famous generals. 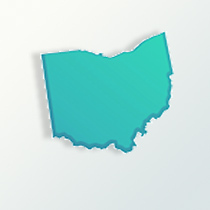 By 1830 Ohio had a population of 937,000 residents. In 1850 it was nearly 2 million citizens due to the migration of people from the eastern coastal states looking for new lands to settle. In 1900 Ohio had 4.1 million and 10.6 million in 1970. In 2009, Ohio has about 11. 5 million people. Those of German ancestry make up 29 percent of the population, an important element in Ohio genealogy. The Irish are 15 percent and English are 10 percent of the Ohio residents. The African-American population represents 12.6 percent due to the large migration of African-American coming to Ohio after the Civil War. The Hispanic ethnic communities in Ohio represent about 2 percent of the population. Manufacturing and financial service are the big industries for the people today in Ohio. Some of the products made include plastics, rubber, fabricated metals, electrical equipment, and appliances.